Our Spinal Cord Injury Program helps to restore independence to children and teens so that they can return home and achieve the highest possible level of functioning. We’re proud of our expertise in spinal cord injury care. 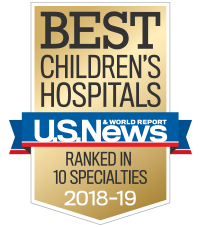 Our recent outcomes surpassed those of other similar pediatric facilities in the U.S. In 2016, we discharged 100 percent of our traumatic spinal cord injury patients to their homes, compared with similar pediatric facilities average of 94 percent. Our patients were discharged six days sooner than those at similar pediatric facilities. At Children’s, we focus on healing the child’s body, mind and spirit. We help children and teens with spinal cord injuries achieve maximum independence. We also teach caregivers and others how to best provide care and assistance. We help ventilator-dependent patients communicate more effectively by using adaptive and assistive technology. The Ventilator Program is designed for children and teens who have sustained injuries or illnesses that affect their breathing ability. Our multidisciplinary team works closely with you to help wean your child off the ventilator when possible. If your child must remain on the ventilator, the team will help prepare you and your child for a smooth transition home. Your healthcare journey with a spinal cord injury or disease has been courageous and difficult. You are encouraged to join Children’s Healthcare of Atlanta to share your recovery story with another young patient just as their journey is about to begin. Who can be a peer mentor? Are you interested in becoming a peer mentor? We are looking for individuals who would like to partner with the Children’s rehabilitation team and become a peer mentor to a child who has a spinal cord injury or disease. You will visit and mentor children while they are in the hospital and participating in day rehabilitation.